Whether they’re gracing a fall tablescape or waiting to be picked from a patch, pumpkins are everywhere these days. If you’re a pet parent with pumpkins to spare, why not share some with your pup? But before you go dicing up a Jack-o-Lantern, keep in mind that there are a few pointers to follow when feeding Fido pumpkin. 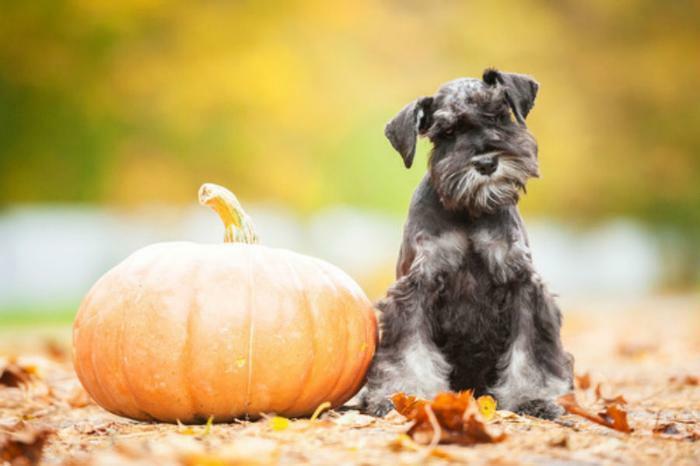 Here are some of the healthiest ways to serve up pumpkin to your pooch. Canned pumpkin is good for both dogs and cats. Regularly adding a bit to your pet’s food can help soothe an upset stomach and keep constipation at bay, experts say. It can be purchased from your local grocery store, where it often sits near pumpkin pie filling. Be sure not to confuse the two, as pumpkin pie filling contains more sugar and spice than a dog’s body can easily handle. Pet parents can also whip up a homemade pumpkin puree by roasting or boiling a small pumpkin, then pureeing it in a blender or food processor. How much pumpkin is safe? Too much of a good thing is possible in the case of pumpkins. They contain beta carotene, which converts to vitamin A -- a fat-soluble nutrient that can be toxic to dogs in excess. The amount of pumpkin you can safely feed your dog depends on his or her size. If you have a small dog, a few teaspoons each day should be enough. Large dogs, on the other hand, can be given a few tablespoons of canned or cooked pumpkin. During a season in which pumpkins are everywhere, pet owners should monitor their dogs to make sure they don’t gorge on gourds. Raw pumpkins are not as pet-friendly as cooked pumpkin. Keep these safety tips in mind to ensure your dog stays healthy. Don’t allow dogs to eat the shell of a pumpkin or gourd. Dogs should never eat the stem or outer shell of a pumpkin. Following this tip is especially important during fall, when pumpkins may be covered in paint, glitter, or other substances that may be toxic to pets. Keep dogs from eating raw seeds. The raw seeds and innards leftover from your pumpkin carving endeavor may tempt dogs, so keep seeds out of paw's reach. Dogs can have pumpkin seeds, but veterinarians recommend roasting and grinding them up first. Discard carved pumpkins after Halloween. After their night of greeting trick-or-treaters, carved pumpkins may begin to deteriorate and grow mold, making them dangerous to dogs. Go flame-free. Candles in carved pumpkins may be a hazard, since pets can easily knock pumpkins over. But you don’t have to sacrifice a glowing Jack-o-Lantern to mitigate the risk of a fire. For a safer, longer-lasting glow, pick up battery-operated candles instead.